Jakub P., Greg B., Dominic C.
It’s a deep dive on today’s Dragon’s Demize, both literally and figuratively! Greg is joined by Dominic Crapuchettes, Founder & Co-President of North Star Games, to discuss their upcoming game Oceans. Oceans is a standalone installment in the Evolution franchise which takes the players on a journey beneath the waves. By combining traits, players seek to take advantage of ecological niches and earn the most points. Oceans has some compelling new features, including separate trait decks for the common “surface” cards and the unique, powerful “deeps” cards and scenario effects that can subtly (or not-so-subtly) alter gameplay when they are triggered. 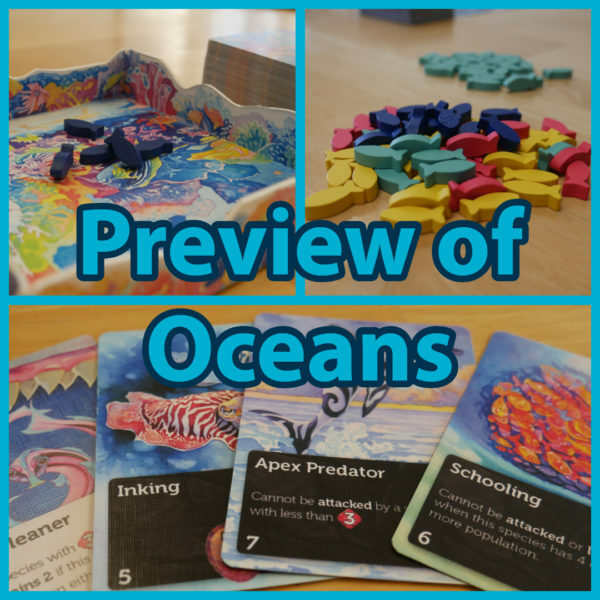 The Kickstarter campaign for Oceans goes live on Tuesday, March 26, and you can bet we’re going to be checking it out. If Oceans sounds like your kind of game, visit the Kickstarter page for more details! Jakub does still get to talk in this episode, mostly about what he’s been playing. He brings us more updates from his ongoing Betrayal Legacy game, as well of his impressions of the new game Call to Adventure. Plus, we’ve been playing The Mind again, and it continues to be ridiculous fun. Thank you as always to O Abnormal and Agata Poniatowski for the artwork and Strangelette for the music. If you enjoyed this episode and would like to support Dragon’s Demize, please consider joining us on Patreon. You can also subscribe to us on Twitch, where we stream every Wednesday and Friday. We’re active on Facebook, Twitter, Instagram, and Discord, so you can join us on your platform of choice. Finally, our own how to play series, Board Game Bistro, and other videos are available on Youtube.